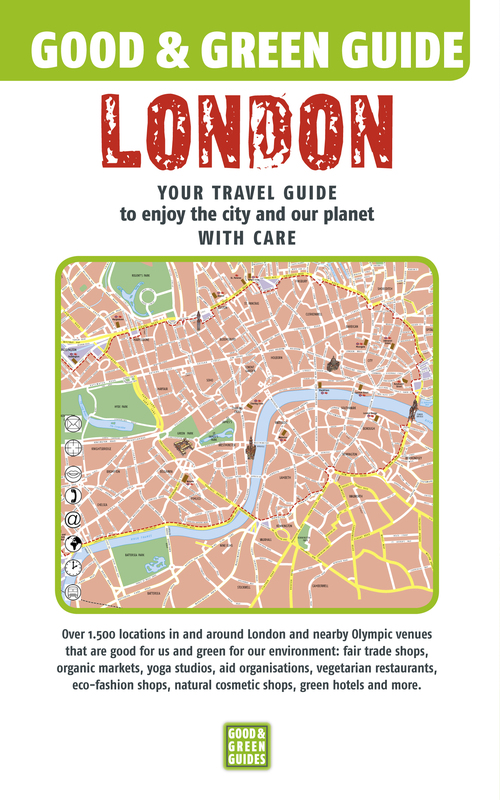 This week sees the launch of London’s first ever Good and Green Guide – a carefully curated guide book that helps visitors and residents of London navigate their way around in a sustainable fashion. It’s timely for London as millions of visitors will be coming into town for the upcoming Olympic games and they’ll be able to experience an alternative way of spending their time and money here. Usually when you travel to a new city, it’s a novelty to find an eco-hotel or an organic cafe. Conscious consumption is something that you must actively seek out and you’re limited in your selection of places you can eat, sleep, drink, shop … but it is not yet the norm and it’s a bit of a mission to plan out good things to do. London’s Good and Green Guide, however makes it really easy – over 1500 things to do, places to go, people to see, food to eat. What I like most about the book is that it isn’t just another guide telling you to rent bikes or eat at vegetarian restaurants. In fact it’s quite the opposite. The book is packed full of inspiring stuff to experience (inspiring being the operative word). I also like the ranking system it uses of ‘good, green and great’ which are awarded to places and activities that can measurably demonstrate social and environmental sustainability. Kudos to Harold Verhagen and friends who have worked really hard to pull this together. Check out the guide. There is also an iphone app. And I’m sure you can help add to it. Tweet @haroldggg your ideas!